Can Digital Artist Tabor Robak Become Pixelangelo? Art made with technology, no matter how cutting-edge, always has a way of becoming kitsch. Think Nam June Paik’s cathode televisions or Cory Arcangel’s self-consciously obsolete video of hacked Super Mario clouds. A work becomes successful when it can both incorporate the technology and exploit it for its ephemerality. Artist Tabor Robak, born in 1986 and certainly part of a millennial technological cohort, hits a sweet spot. The uniform slickness of Robak’s computer-graphics renderings of sometimes-mundane, sometimes-extraordinary objects and technological interfaces might look recognizable from contemporary video-games. But in reality, they are exponentially more elaborate. Robak models his videos by hand, exploring the medium of CGI the way Michelangelo did marble. It’s an arduous, individual process — one hand on one mouse — but it’s executed in a way possible only in the 21st century. Rather than crunching them himself, Robak sends his enormous files, so large precisely because they’re hand-modeled, out to a “render farm” where the data can be processed quickly. “Ours is in Florida in someone’s garage or something. A guy with a ton of computers,” says Todd von Ammon of TEAM gallery, where Robak is mounting a solo exhibition called “Fake Shrimp” through June 7. 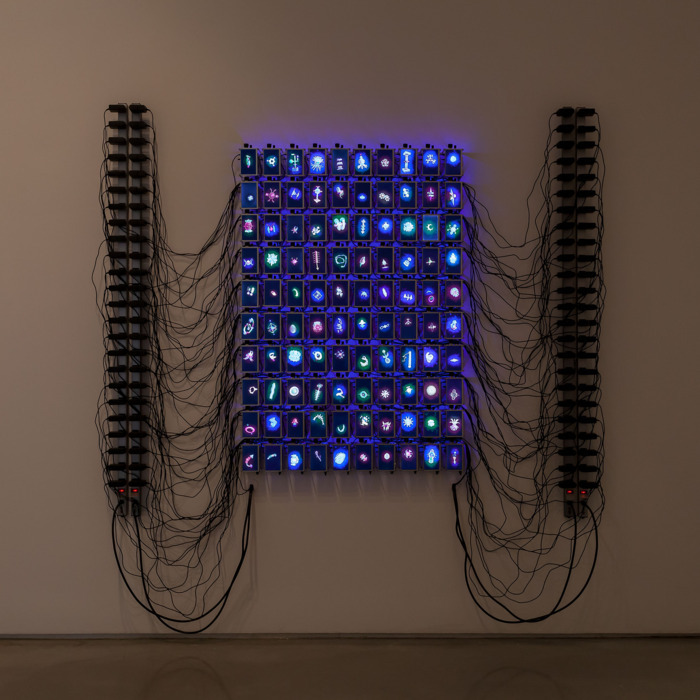 The artist’s engagement with both the aesthetics and the mechanical processes of technology bring to mind similarly buzzed about names like Artie Vierkant and Katie Steciw. “Fake Shrimp” is composed of just a few pieces, hinting at the time required to complete the work. 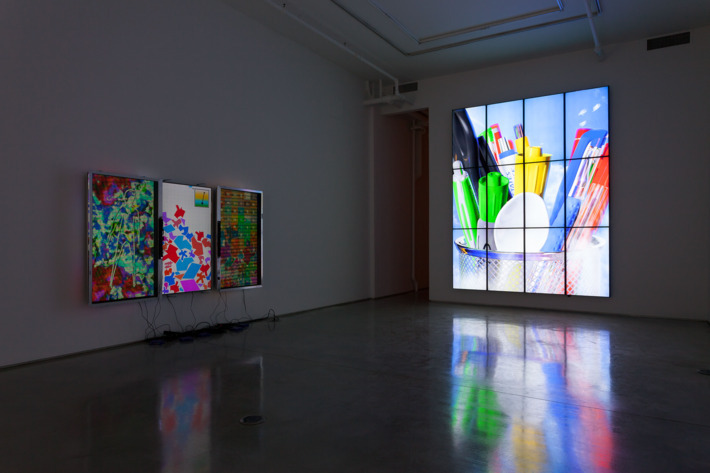 Where’s My Water is a wall-size array of televisions that beam a composite detailed animation of pens in cups, suggesting a vast, surreal collection of desk surfaces. Butterfly Room, in contrast, is a digital bestiary of creatures fluttering in a grid of tiny LCDs. Robak led us through the intricate pieces in the show and explained the digital workflow needed to sculpt in pixels. 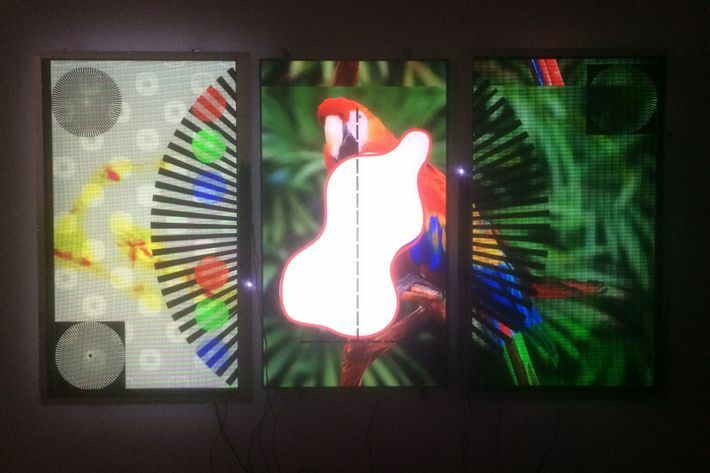 This three-panel work features two transparent LCD screens that splash pixels in an invisible layer over the top of more traditional television panels. The animation itself displays the building blocks of visual culture: letters, symbols, and diagrams evolving into kitschy high-definition footage of wild animals. It’s a deconstruction of the way we see, both onscreen and in the physical world. Tabor Robak: I took inspiration from textbooks about vision and baby visual stimulation cards I did when I was a kid. I’d like to get some babies in here and park them in front of it. I think it’d get them ready. Maybe a year ago I saw some random YouTube video of these transparent screens existing. I just searched the internet until I found one I could buy. I had no clue if these things were going to work. It sounded too good to be true. It’s a fantasy that’s been promised to us by science fiction. Then you get them and they’re very material. They’re not totally clear, it’s kind of brown, grids overlap, pixels create a moire pattern. There’s a wonderful distance between what you expect of a transparent screen and the transparent screens we have. I love the way they look. On a wall-size grid of screens, Robak displays a kind of animated slideshow of various cups filled with pens, among other objects — the tools of creative work. The visuals symbolically hint at the artistic process, but the execution is all about labor as well. The pens, cups, and abstract patterns of the video are hand-modeled in a process that taxes even powerful computers. Robak: I started noticing pen cups all over the place, seeing them in a laundromat, a friend’s home, at TEAM gallery. It’s this little picture of a person, in a way. I started making pens and getting so obsessed with detail, trying to work on it at a huge scale. The computer doesn’t like it, but I enjoy it. The flowerpot one is definitely modeled after my aunt. You clearly get an idea of a crafty mom or something. A couple are in a total fantasy world, like the one that’s stabbed through with pens. I have a specific way of rendering objects, which is not just iconic but almost like a shared ideal image, in a way. That’s also captured in the way that the objects are lit with a heavenly glow, a little sparkle. I go with what the tool naturally encourages. It does shiny surfaces really well, so it’s a shame not to use shiny surfaces. A grid of small screens is rigged up with very visible wiring to make this bestiary of digital creatures. Each animation, made up of tiny tubes, spikes, and whirring legs, like a biologist’s encyclopedia of cells, lives its own unique existence in loop of video a few minutes long. The piece is an exercise in playing a digital god. Robak: A lot of the work in the show is about work, is about making. I wanted to make something that I hadn’t made before, make something more with my hands, from scratch, not like with these big TVs. I dove into working with electronics and didn’t know where it would take me. This piece reminded me of this Pokémon poster I had as a kid, with all the Pokémon laid out. The size of those screens is kind of like a little vessel to put a creature in. I went through the exercise of creating these little characters — there’s a little bit of a genealogy through them, it just naturally happened in the process of making 100 of them. There’s an evolution in them. With the hardware, I can make it as elegant as I can, but there’s no way to hide it. That’s just part of the nature of it, in a way, another feeling of creation. It’s kind of like these little creatures are on life support or they’re stuck on an electric fence.